SoBe had a ton of slightly aged prizes just laying around their storerooms. They needed an exciting way to give all that stuff away while simultaneously increasing their Facebook fan count. The experience not only had to draw in new likes, but also keep those new fans coming back for more. All the while, SoBe’s line of "exotic" flavors had to shine through. The SoBe Garage "Sale" was a riff on the typical summer pastime. Users "liked" the brand to enter the Facebook tab and there they learned about the exotically themed giveaway. 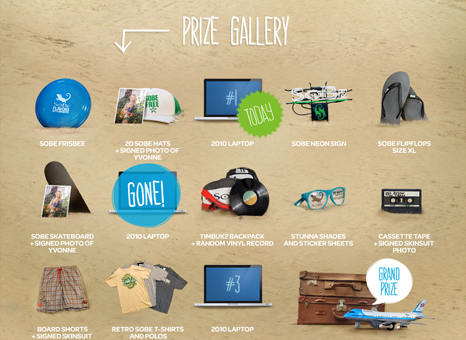 The prizes changed every day and each one was announced in its own video—everything from signed swimsuit model photographs to SoBe gear, vintage vinyl records and pristine, if slightly old, laptop computers. A low-fi turntable showed off the goods, working as an offbeat advertisement. To keep users coming back, the experience allowed them to enter for a chance to win once a day. 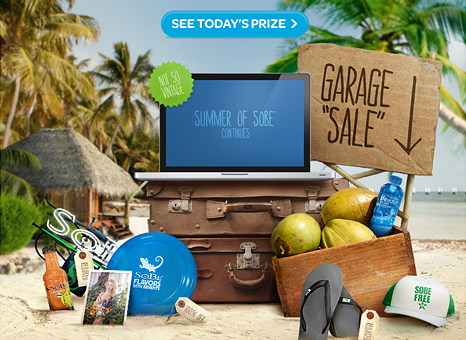 With the SoBe Garage "Sale" giveaway, summer never had to end.